The USS Leviathan at harbor in 1918. 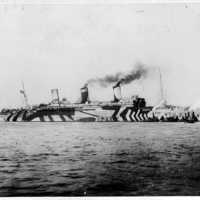 She was acquired from Germay by the United States Navy in 1917 and served as a troop transport ship until her decommissioning on October 29, 1919. 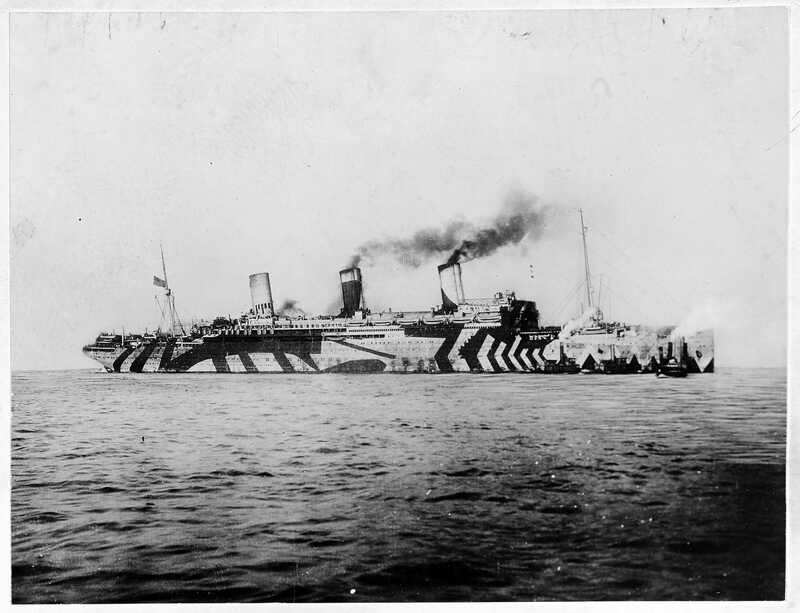 Here, she is decorated with what is called "dazzle" camouflage, which is what she bore from April to December 1918. Fred White (1898-1919) and the 547th Engineer Service Battalion were transported to France on board the Leviathan in October 1918. Fred White was born on March 14, 1898 in Marianna, Florida, and was raised by his grandparents. He eventually moved to Youngstown in the neighboring county. There, he worked as a laborer. On June 5, 1918, he registered for the draft, adding a year to his age to make himself eligible. On June 15, he married Mamie Grey Kennedy. Two months later on August 21, White was inducted into the Army and trained at Camp Joseph E. Johnston near Jacksonville, Florida. After, he joined Company C of the 547th Engineer Service Battalion and departed for France on October 27, 1918. Engineer units served in a technical capacity, and though they weren't allowed to carry firearms in France, they often saw the heat of battle. It is unlikely, however, that White and his unit saw combat before the war ended in November 1918. After the war ended, White succumbed to the influenza epidemic of 1918-1919 on February 1, 1919. The pervasive discrimination of white doctors against African American troops meant that those units saw a higher mortality rate than white units or civilians. White is buried in the Meuse-Argonne American Cemetery in Romange-sous-Montfaucon, France at Plot C Row 7 Grave 3. In 2017, the University of Central Florida was one of three universities selected to launch the National Cemetery Administration’s Veterans Legacy Program Project. The program engaged a team of scholars to make the life stories of veterans buried in the Florida National Cemetery available to the public. The project engages UCF students in research and writing and fosters collaboration between students, faculty and local Central Florida schools to produce interactive curriculum for k-12 students. The corresponding website exhibit uses RICHES Mosaic Interface to create a digital archive of related data. The public can use the project-developed augmented-reality app at more than 100 gravesites at the Florida National Cemetery, where they can access the UCF student-authored biographies of veterans. Digital reproduction of original black and white still photograph: U.S. Naval History and Heritage Command Photograph, NH 71. Originally created by the United States Navy and published by the Naval History and Heritage Command. • distribute copies or digitally transfer the work to the public by sale or other transfer of ownership, or by rental, lease, or lending. This resource is provided here by RICHES for educational purposes only. For more information on copyright, please refer to Section 5 of Copyright Law of the United States of America and Related Laws Contained in Title 17 of the United States Code. Abney, Barb. "VA Selects UCF Historians to Archive Stories of Deceased Veterans." UCF Today, March 13, 2017. Accessed August 9, 2017. https://today.ucf.edu/va-selects-ucf-historians-archive-stories-deceased-veterans/. American Battle Monuments Commission. "Fred White." American Battle Monuments Commission. Romagne-sous-Montfaucon, France. Accessed September 3, 2018. https://www.abmc.gov/node/329776#.W40mOehKi01. Bay County Judge. "Fred White." Florida County Marriages, 1830-1957. Online database with images, FamilySearch. Bay, Florida. FHL microfilm 988,464. Accessed September 3, 2018. https://www.familysearch.org/frontier/search-artifact/ark:/61903/1:1:FWM-VZ5. Byerly, Carol R. "The U.S. Military and the Influenza Pandemic of 1918-1919." Public Health Report 125, no. suppl. 3 (2010): 82-91. Dalessandro, Robert J. and Gerald Torrence. Willing Patriots: Men of Color in the First World War. Atglen, PA: Schiffer Publishing Ltd., 2009. Florida Department of Military Affairs. "Fred White." Online database with images, FloridaMemory. Panama City, Florida. Army Box 16. Accessed September 3, 2018. https://www.floridamemory.com/items/show/223055. Keene, Jennifer. World War I: The American Soldier Experience. Lincoln, NE: University of Nebraska Press, 2011. Naval History and Heritage Command. "NH 71 USS Leviathan (ID #1326)." NHHC. Accessed September 4, 2018. https://www.history.navy.mil/content/history/nhhc/our-collections/photography/numerical-list-of-images/nhhc-series/nh-series/NH-00001/NH-71.html. NavSource. "Leviathan (ID 1326)." Section Patrol Craft Photo Archive. Accessed September 4, 2018. https://www.navsource.org/archives/11/171326. <a href="https://www.navy.mil/" target="_blank">United States Navy</a>. “Navy Ship, 1918.” RICHES of Central Florida accessed April 24, 2019, https://richesmi.cah.ucf.edu/omeka/items/show/10388.